So this is the preliminary layout of the "Dirty Dave" shirt featuring Dave Blachura boosting a disco can-can at The Lot. 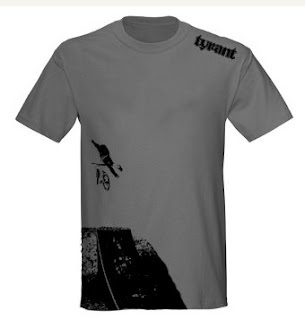 I'm sure there will be a few tweaks made, but if all goes well we'll all be rocking these shirts at the Slopestyle Open Competition that Dave is competing in at Highland on June 27th. In other dirty news, my cousin will be showing up to the TNT Trails with his Kubota tractor on June 28th. We'll be spending the whole day digging, stacking, and packing as many jumps as we can to get the trails dialed in and up and running. If you are around that day, come lend a hand! Sometime in early July we'll be having a trails jam and the Reverend Matt Lolli will be blessing the trails and we'll christen them with a Colt 45 toast. I'll have more info as the date approches.